Being in a creative business is totally new for me. Like, totally. 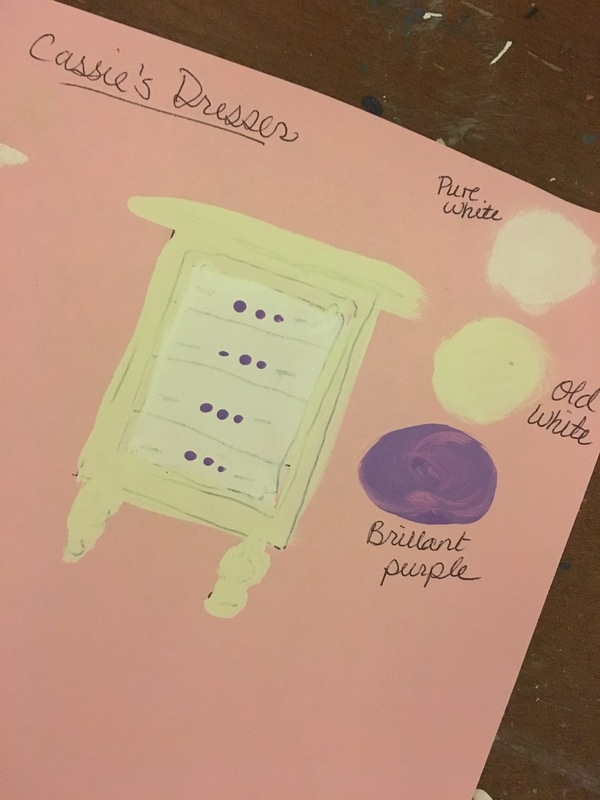 I picked up a paint brush to put my design ideas to furniture for the first time EVER in August of this year (4 months ago). Boom -passion was born! I had the feeling I was doing exactly what I was meant to do. Has that ever happened to you? An ah-ha moment when you learn something you know will change everything…? It’s the best feeling. Prior to that, I had an eye for design & decor that I put to use in my own home only. I’m constantly thinking, creating, mixing colors, reading blogs, studying techniques, -you name it. I’ve logged hundreds & hundreds of hours studying my new love. I still get nervous before I start a new piece. I will attempt anything my mind can come up with, big or small, and it is so.much.fun! 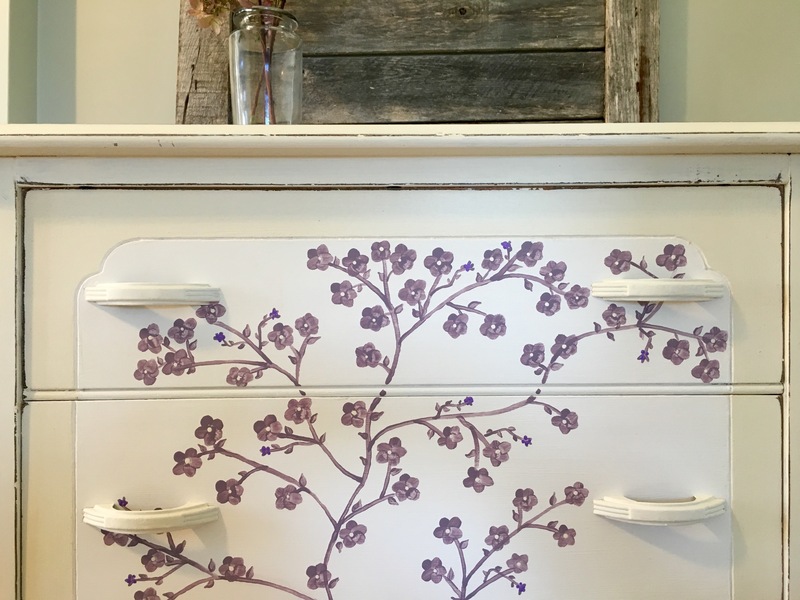 So, recently when I had a request for a dresser to be finished in white with purple flowers for a little girl, I went on the hunt for the perfect dresser. It had to be small (3 feet x 2 feet) and hold a reasonable amount of storage. 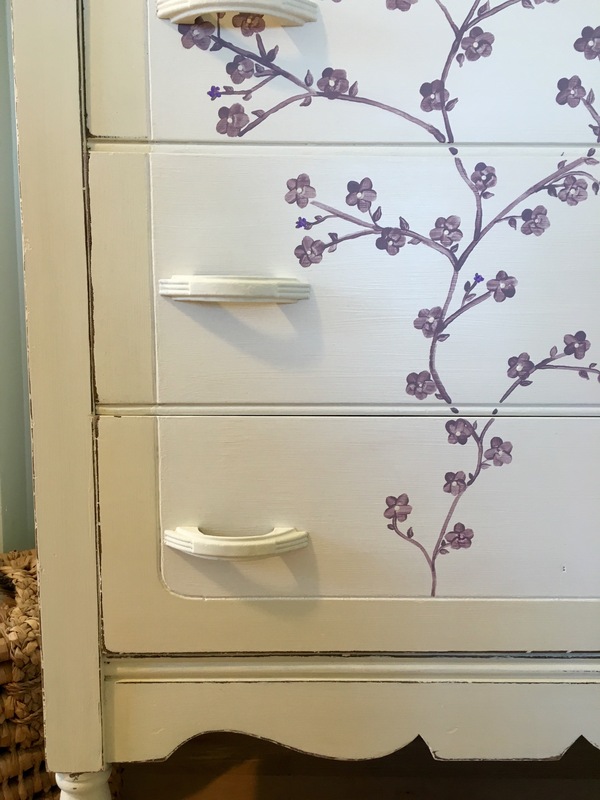 I found a 1930’s Depression era dresser & had an instant vision. The scary part for me? I have never, ever painted flowers before, especially over a large area. This is the initial sketch. 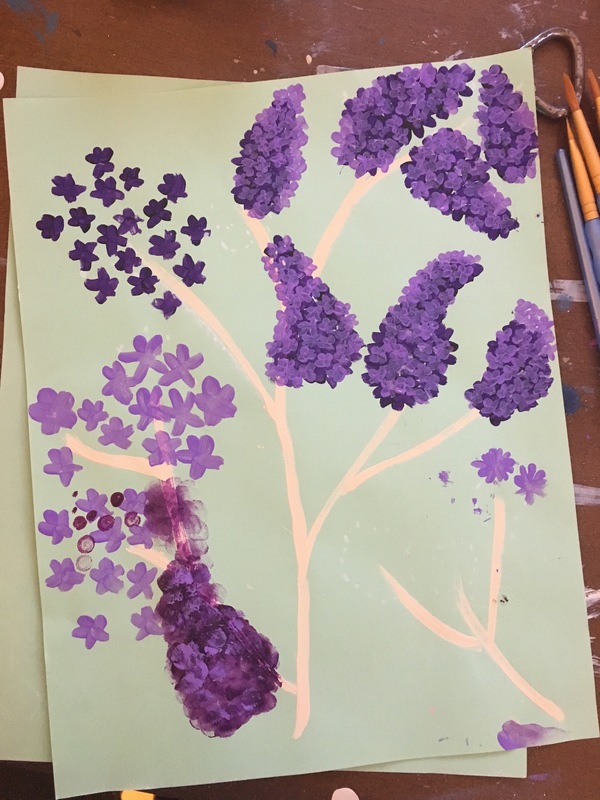 I tried lilacs & tree branches, too. They weren’t right for the dresser. 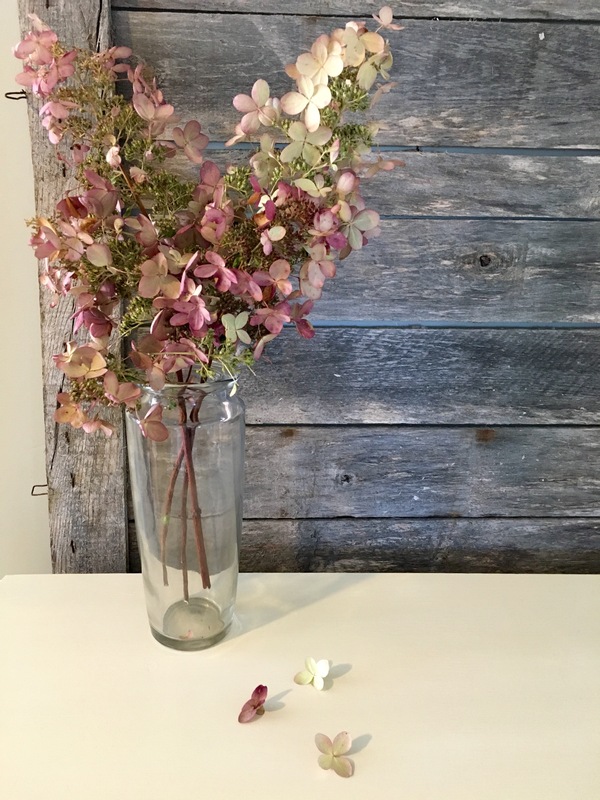 Then, I looked at my dried hydrangea. It was the perfect inspiration! 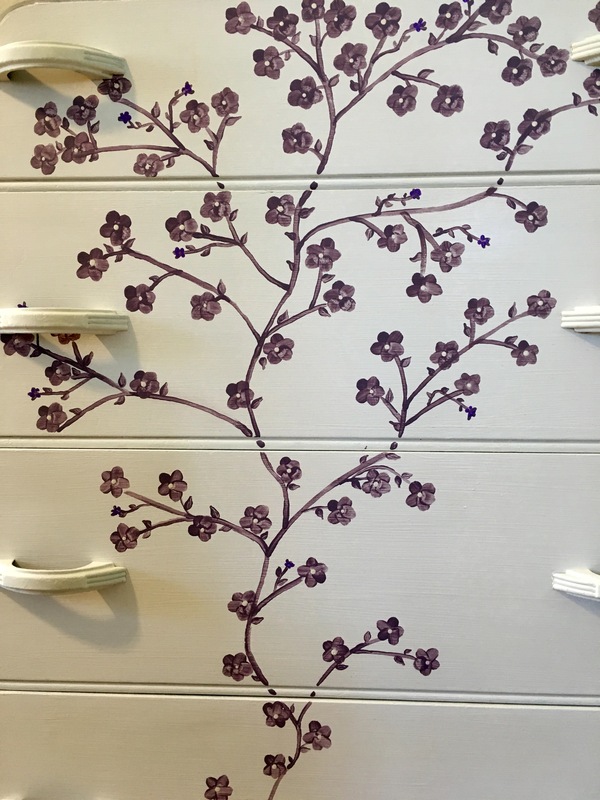 I wanted a feminine, beautiful, curvy vine that appeared to grow up from the bottom of the dresser; small at the bottom to full blooms at the top. I also wanted the quality of the flower to suit a little girl. I chose Old White for the body & Pure for the centre back drop. The flowers are in Emilie, and the new buds are a slightly darker purple. It’s distressed to show off the amazing vintage lines & finished in 2 coats of clear wax (3 on top). 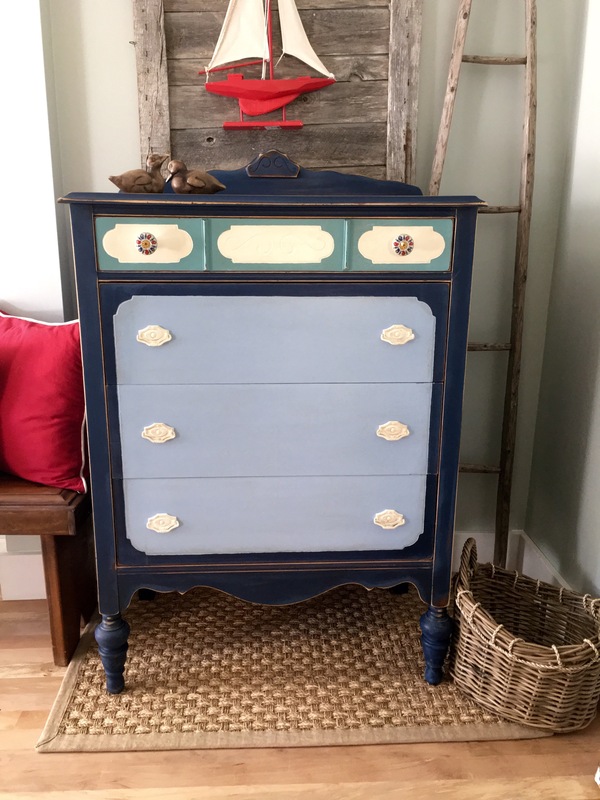 All colors are from the Annie Sloan line, which I currently use exclusively, though I’ve been thinking of trying milk paint. I love the little fallen hydrangea petals on top of that one. Happy painting & see you next time. I’m sipping tea and feeling grateful. It’s Tuesday afternoon, and I just finished a little dresser that I love. Making over furniture gives me a huge thrill. My head is so filled with ideas about what I want to try next that I have to keep a notebook just to clear the constant reel of ideas. I love love love feeling that inspired! It’s the mark of passion. I’ve been exploring the antique market in beautiful Valley Nova Scotia on the weekends. I have a deep love of all things old. 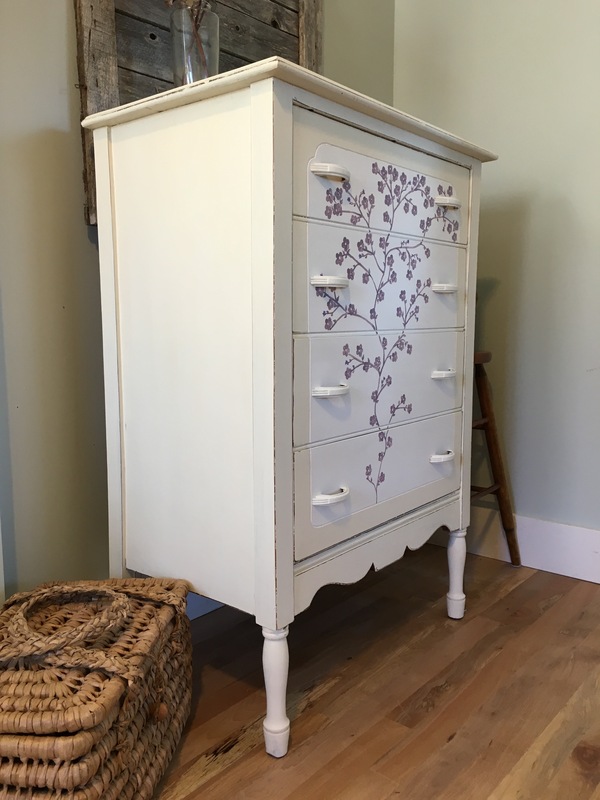 Antiques are my favorite thing to makeover, so I love looking for my next great find. I’ve visited Sunnyhill Antiques, The Old Meeting House Antiques, and Country Barn Antiques. All of these places have been story-book cool to visit. 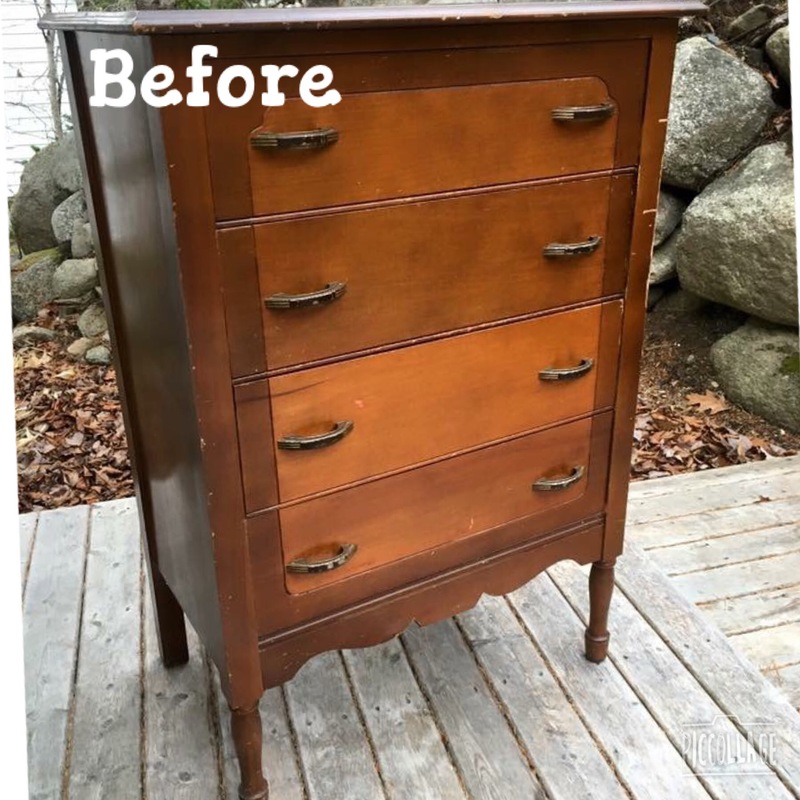 Plus, it had all the makings of a perfect makeover candidate: the ugly “blown tiger” faux oak finish in an orange color, tons of scratches on top including an etched happy face, bumpy stain from age & use, and the usual dents and dings that give character to any piece. I was a happy camper when I found this. Here’s how it looked before. I have this instinct sometimes with furniture (and rooms in a house) that when I look at it, I get an instant vision in my mind’s eye of how it will look made over. That’s why I say furniture “speaks” to me. I’m like the Harry Potter of furniture; instead of speaking parseltongue I speak furnituretongue. (For the non Harry Potter fans who didn’t get that joke…oh, you should totally read it! But I digress). 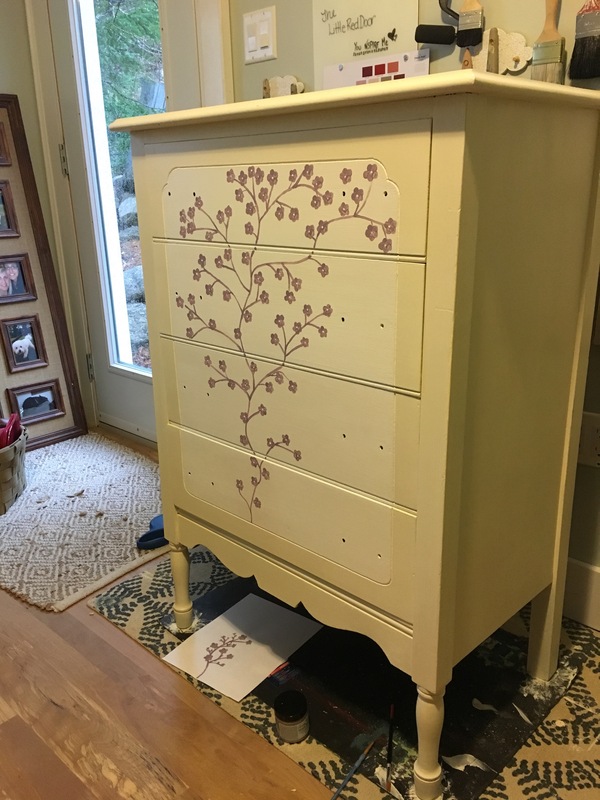 So, I saw this dresser as light blue with a hand painted design in a contrasting color from the beginning. 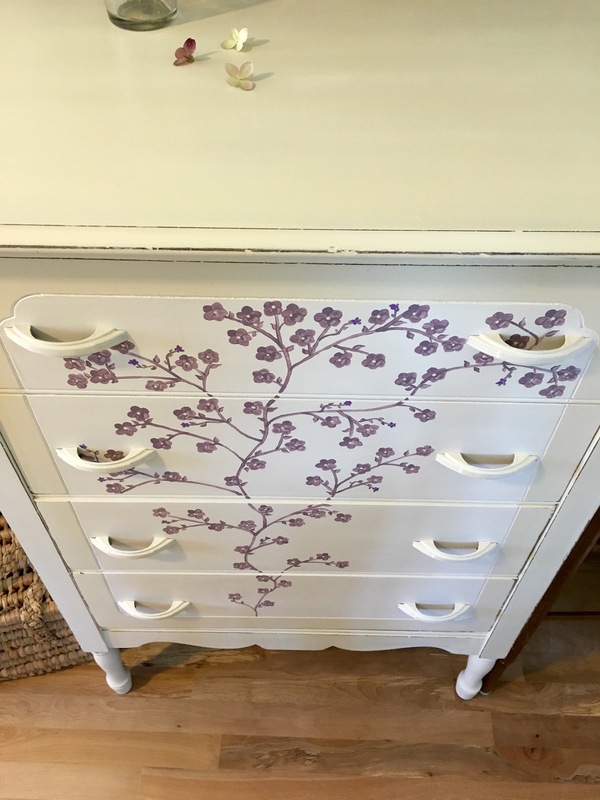 I saw a fleur de lis pillow when I was out antiquing, and I knew that’s what I wanted on the drawers. 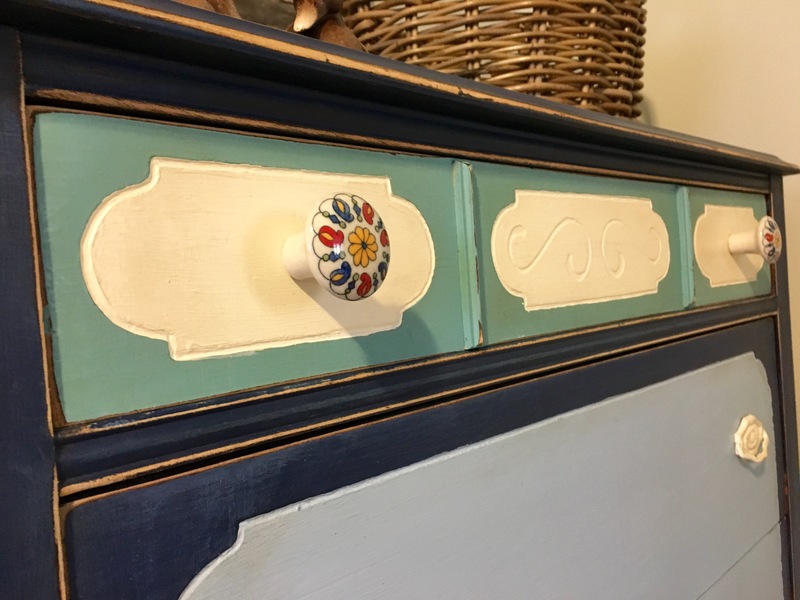 I chose Louis Blue for the body of the dresser and Old Ochre for the highlights from the Annie Sloan Chalk Paint collection (ASCP). There are two options for hand painting -stencil or no stencil. Up to this point, I have always free-hand painted. 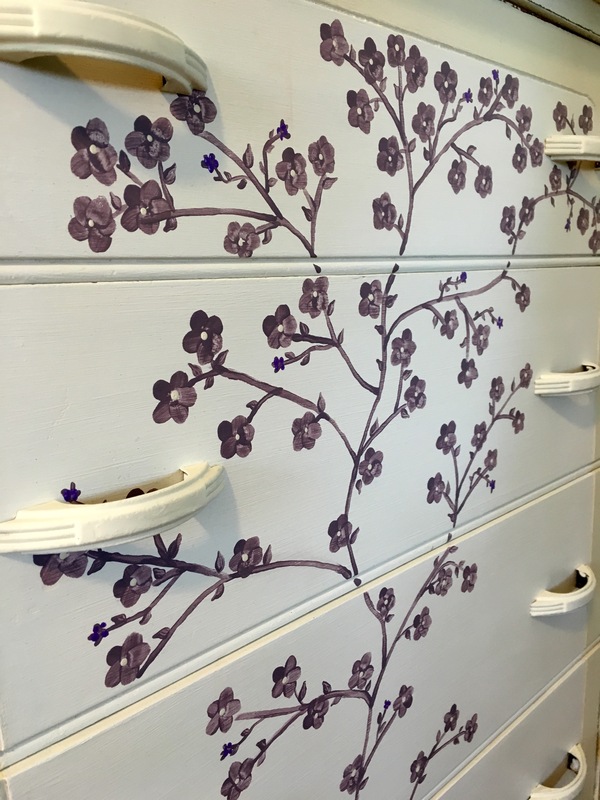 In fact, I’ve never used a stencil before this dresser! There are pros and cons to both. 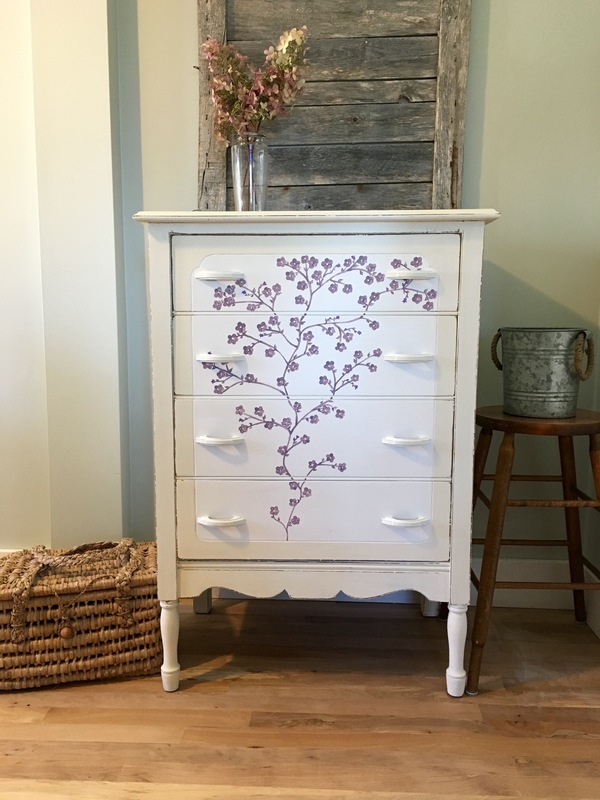 I love unique & original creations, the look of imperfect yet beautiful brush strokes, and the color variation that often accompanies free-hand painting. I also love the look of a really great stencil. 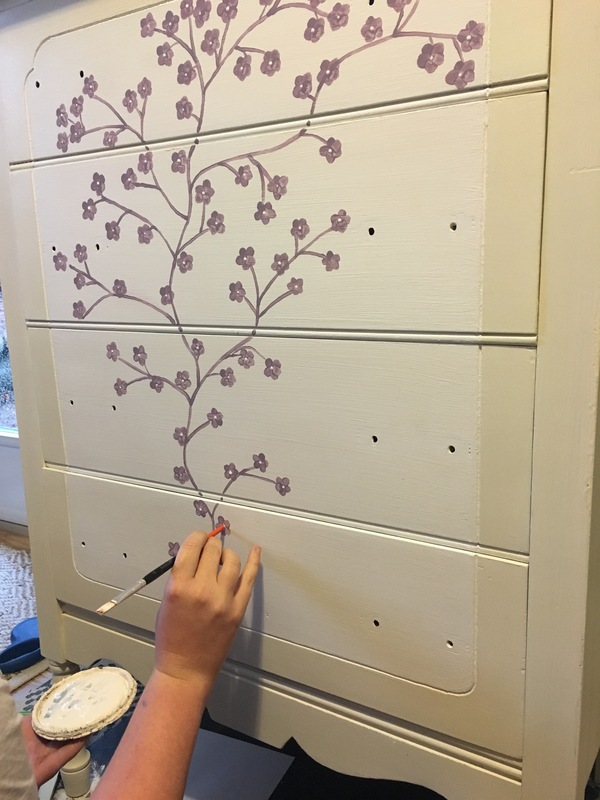 A bonus of stencils is that they are quick, and excellent when you need a good, clean line. 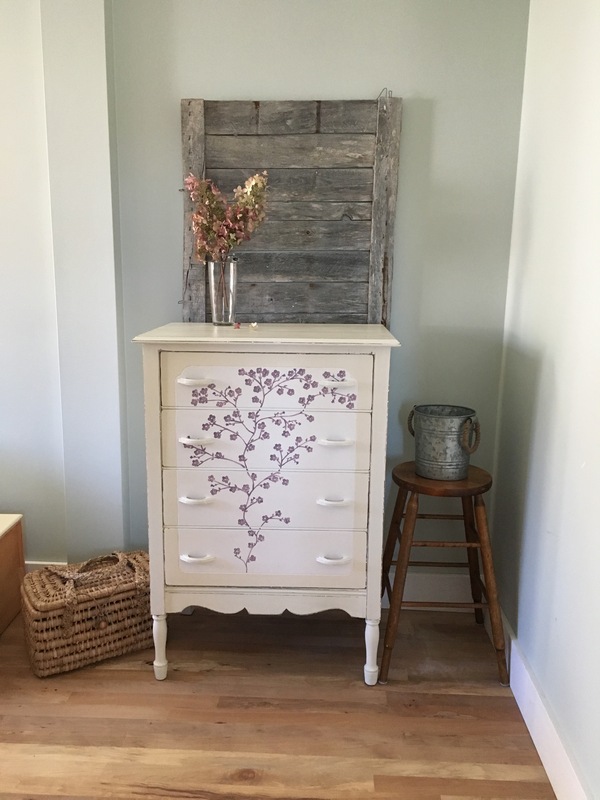 I wanted this dresser to have the feeling of old & worn and imperfect, and I wanted the fleur de lis to have a wall paper look to them. I also wanted to finish quickly. I decided to use a stencil to achieve the wallpaper effect and the quick timeline. To achieve the imperfect look I was after, I decided not to measure spacing, or use a level for my lines when applying the fleur de lis. This sounds risky, I know. But don’t worry. I have a good eye. I cut it out of the main stencil and taped it to cardboard to make it easier to work with. I cleaned and lightly sanded this piece to prepare for paint. 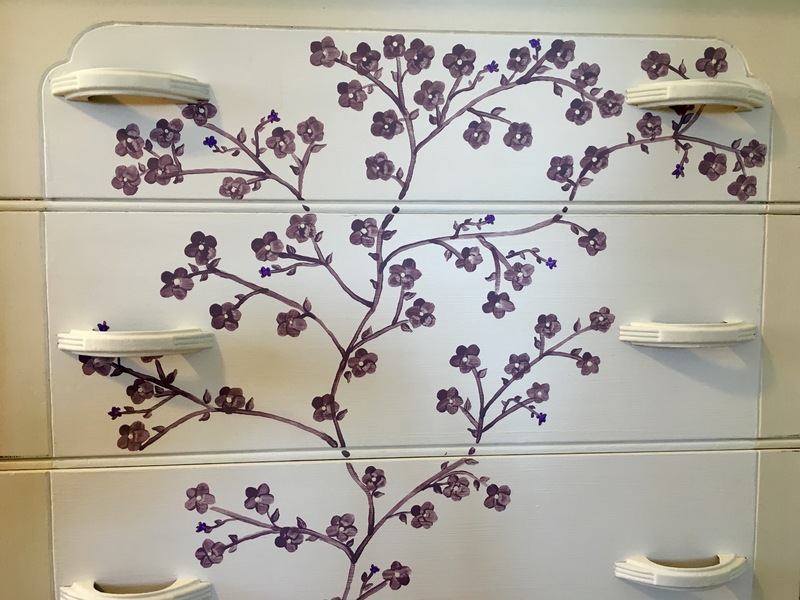 I left dark stain on the corners of the main body of the dresser so that when I distressed after, there would be a contrast of dark color against the blue. 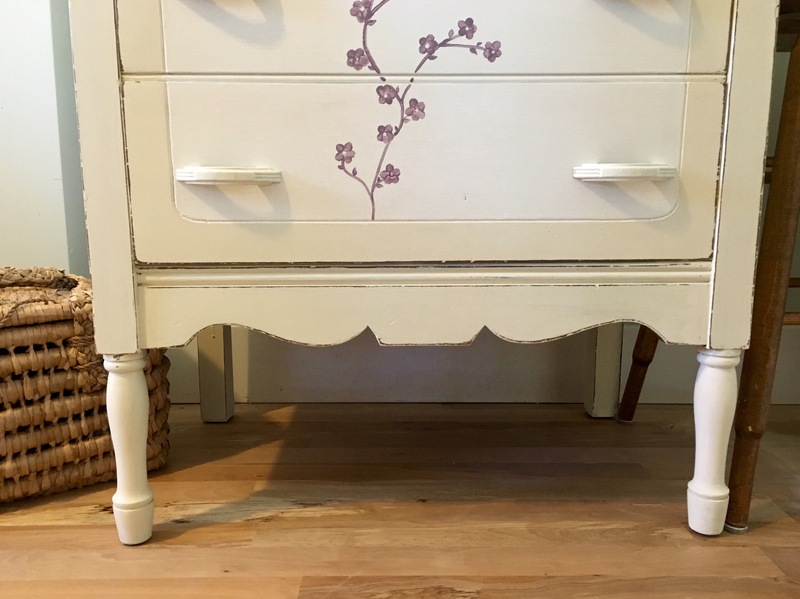 I painted the whole dresser using random, thick brush strokes because I wanted texture and depth in my finish. I gave this three coats of paint. There was some bleed through after the first coat, so I used two coats of Shellac to seal it before applying the final two coats of Louis Blue. 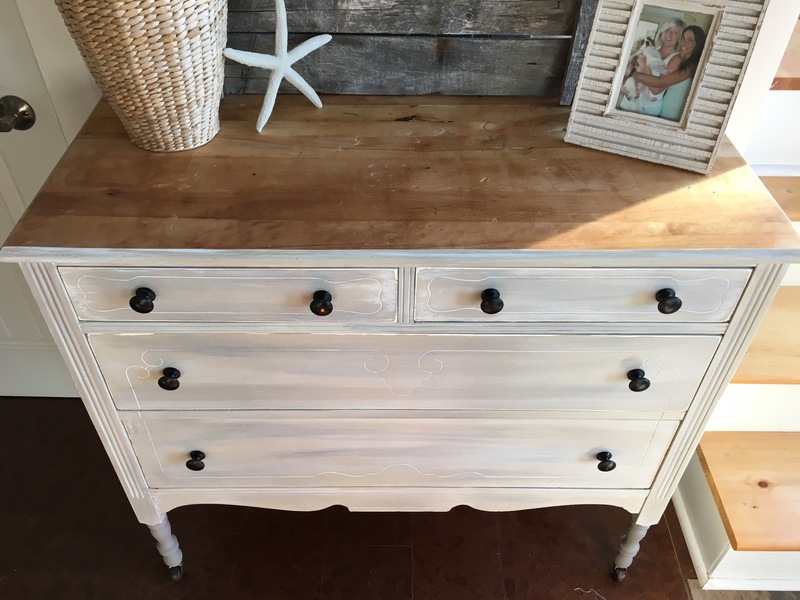 Once painted & dried, I added a ‘ragged-on and then wiped off’ coat of Old White to the drawer fronts. This creates a cloudy finish and highlights the texture I created with my brushstrokes by settling in to the grooves. I added the fleur de lis pattern in Old Ochre using a Martha Stewart stencil I found at Michaels. I used a sponge roller that I only somewhat enjoyed. But BOY was it fast! There is a learning curve to stencils, but I’ll save that for a different blog post. 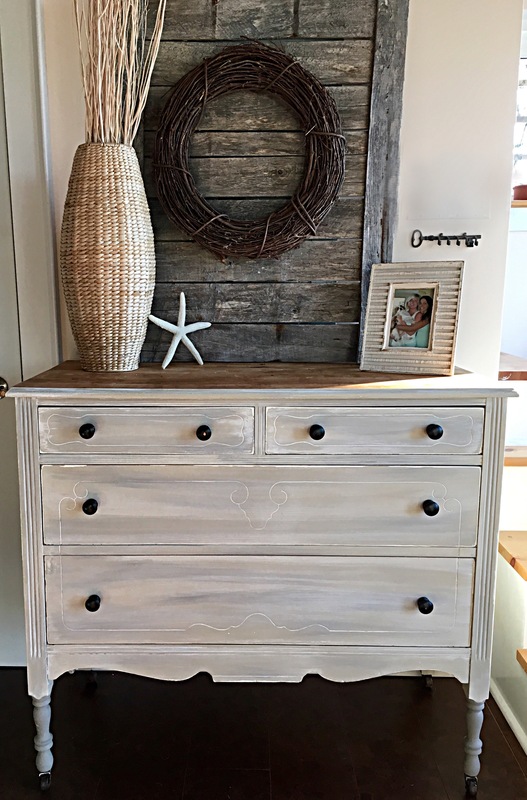 For the body of the dresser, I wanted lots and lots of texture and depth of color. I dry brushed the high points on the body of the dresser in Old Ochre taking care to use more paint than I normally would, and to drag the paint further in on the piece to create a fuller line. I did that because I knew I would be distressing to the dark I left underneath and I didn’t want all of my Old Orchre to get sanded off. Note the depth of the strokes and the opaque quality…normally dry brush is light and feathery. Now, the distressing shows through but the Old Orchre hasn’t been sanded completely away. I also painted the hardware in Old Orchre, and distressed it for contrast. Then, I waxed the whole thing in 2 coats of clear wax from the ASCP line. Look at the texture created by the brush strokes, the wash in Old White, the dry brushing in Old Ochre, and the distressing. Yummy! I hope you’ve enjoyed this! It was a lot of fun to create. Happy painting & see you next time!